The hygienic processing of food concerns both potential hazards in food products and the regulation, design, and management of food processing facilities. This second edition of Hygiene in Food Processing gives a revised overview of the practices for safe processing and incorporates additional chapters concerning pest control, microbiological environmental sampling, and the economics of food plants. Part one addresses microbial risks in foods and the corresponding regulation in the European Union. Part two discusses the hygienic design of food factory infrastructure, encompassing the design and materials for the factory itself, as well as food processing equipment. This edition includes a new chapter on the control of compressed gases used to pneumatically operate equipment. Part three focuses on cleaning and disinfection practices in food processing. The chapter on cleaning in place also considers more cost-effective systems, and complements the additional chapter on maintenance of equipment. These chapters also explore issues such as the hygiene of workers, potential infection by foreign bodies, and pest control. Further, the chapter on microbiological sampling explains how to calculate the risk of contamination depending on the product's environment. 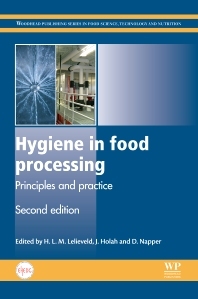 This essential second edition is useful to professionals responsible for hygiene in the food industry. It provides a comprehensive, yet concise and practical reference source for food plant managers, suppliers of food processing equipment, building contractors, and food inspectors looking for an authoritative introduction to hygiene regulation, hygienic design, and sanitation. Excellent resource for both professionals and academics. Huub Lelieveld is Co-founder and President of the Global Harmonization Initiative, Member of the Executive Committee and a Past-President of EFFoST (the European Federation of Food Science and Technology), Founder and Past-President of EHEDG (the European Hygienic Engineering and Design Group). He is a fellow of IAFoST (the International Academy of Food Science and Technology), a fellow of IFT (the Institute of Food Technologists), served on the Governing Council of IUFoST (the International Union of Food Science and Technology) and has been Chair of the Nonthermal Processing Division and the International Division of IFT. At Unilever, he was responsible for hygienic processing and plant design and novel processing technologies. He is lead editor of “Hygiene in food processing”, the “Handbook of hygiene control in the food industry” and “Food preservation by pulsed electric fields: From research to application”. He is co-editor of several other books, including “Ensuring Global Food Safety: Exploring Global Harmonization”, “Hygienic design of food factories”, ”Food safety management: a practical guide for the food industry” and “High Pressure Processing of Food – Principles, Technology and Applications”. He wrote chapters for many books and encyclopaedia, wrote hundreds of scientific articles and articles for magazines and presented hundreds of papers, globally. He is a member of many editorial boards of books, journals and magazines. He initiated “People, planet, prosperity and the food chain” in short P3FC, an organisation of which the sole objective is to remind the food industry as frequently as possible that besides caring for shareholders, they also share responsibilities for planet and society. He has been awarded doctor honoris causa at the National University of Food Technologies (NUFT) in Kiev, Ukraine. Global Harmonization Initiative (GHI), Vienna, Austria; European Hygienic Engineering and Design Group (EHEDG), Rotterdam, The Netherlands The Global Harmonization Initiative (GHI) is registered in Vienna, Austria; the European Hygienic Engineering and Design Group (EHEDG) in Rotterdam, the Netherlands; the European Federation of Food Science and Technology (EFFoST) in Wageningen, The Netherlands, International Union of Food Science and Technology (IUFoST) in Ontario, Canada. Prof. Dr. John Holah is an applied microbiologist who has focused on the prevention of microbial, chemical, and foreign body contamination of food during manufacture and retail distribution, on a worldwide basis. He is currently Technical Director of Holchem Laboratories (UK), Visiting Professor in Food Safety at Cardiff Metropolitan University and was previously Head of Food Hygiene at Campden BRI. David Napper is the Managing Director of Enviro- Development, Denmark.